The Themistokleous 58 for people with and without papers in Athens, Greece was attacked last night. Four people were seriously injured. 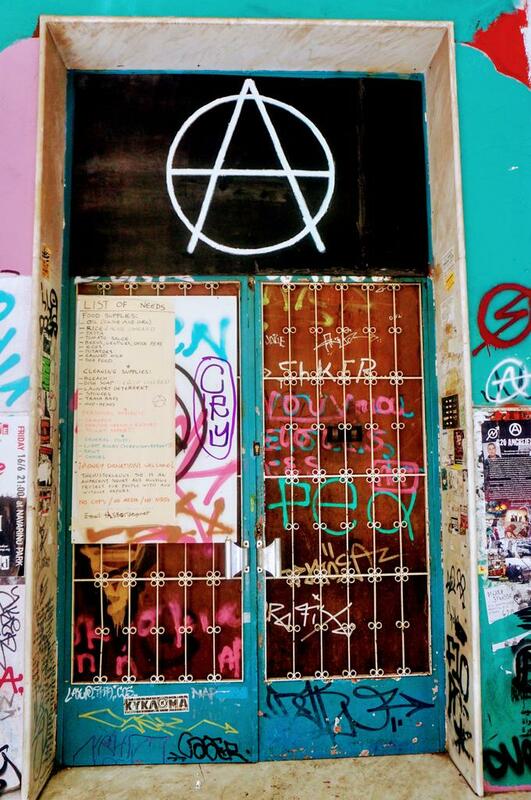 Image: The Themistokleous 58 squat in Athens, Greece. Originally published by Contra Info. Read all our reports about Themistokleous 58; here. The squat Themistokleous 58, known as T58, in Exarchia, was attacked by people wearing helmets. This was a mafia style attack which resulted in 4 injured comrades in serious condition and who are hospitalized. Information about the attack and its causes will be announced by the T58 Assembly. 2. Attackers, literally fascistically, with metal & wooden beads, as well with knives, rushed straight to the heads housed in K * Θ58; Among the fascists were recognized members of squats and migrants, as well as the cigarettes dealers which sells tobacco and other substances near to T58. A political text is expected from K * Θ58. AYS Daily Digest 17/08/17: New old route — Spain – Are You Syrious? #Athens: Solidarity for Injured Comrades of Themistokleous 58 | Enough is Enough! #Athens: After the Attack Against the Themistokleous 58 Squat | Enough is Enough!